Sophomore Gavin Brenneman writes and directs his first one act "With Everlasting Love, Monika"
Down on the ground begging for MC to not kill her, Monika looks stage left to see Sayori standing in between the wooden door. With the spotlight on Sayori, MC runs to embrace her, his best friend has been brought back to life. “With Everlasting Love, Monika” is the first play that sophomore Gavin Brenneman has written and directed. Looking to video games for inspiration, Benneman adapted his one act on the video game, “Doki Doki Literature Club”. When it came to his writing process, Brenneman kept chances of duplicating the video game to a minimum. To do so, he played the four hour long video game “Doki Doki Literature Club” eight times. Opening the one act, Brenneman had to provide his audience with a disclaimer that his one act includes some scenes and mentions of suicide. However, cast members like senior Lucas Laguer believed that the scenes wouldn’t be too much for the audience to handle. Other cast members like junior Tammy Ngyuen were unsure on their view of the suicide scenes, however Ngyuen also admitted that these scenes added to the authenticity of the one act. 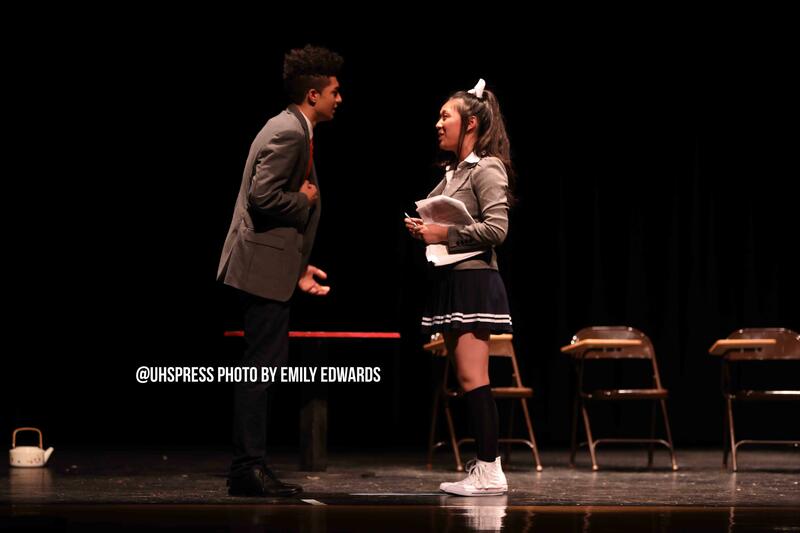 As their first performance of the year, Ngyuen encouraged students to attend a day of the one acts as a way to support the actors in the theatre program.